Anonymous billon drachma; 10 - 12 c. A.D. OB: stylized head r.; RX: stylized fire altar (up-side down). REF; Deyell # 156-159. Silver 4g. 17.22 mm. During the 9th and 10th centuries, the kingdoms of Western India, including the Chavadas and Chalukyas, issued large numbers of silver coins modeled on Sassanian prototypes. These coins featured a king's head right on the obverse and a stylized fire altar on the reverse. Over time, the bust and the fire altar became more and more stylized. 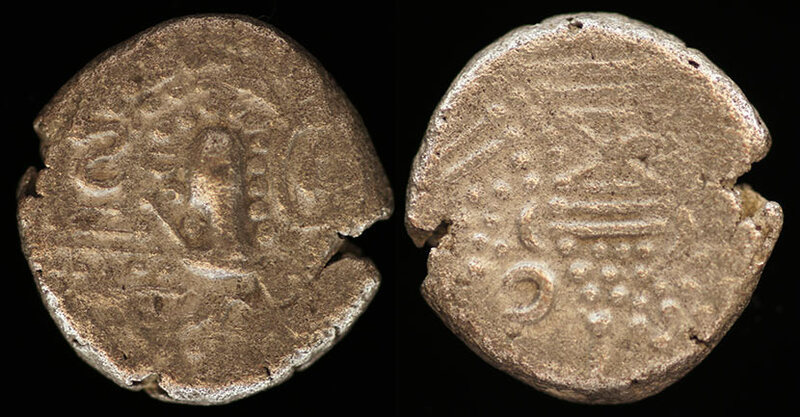 Coin 27 is an example of this coinage, where the bust is still quite recognizable, but the fire altar has become a series of dots and lines at various angles. These coins are normally referred to as "Gadhaiya" paisas, although nobody seems to know how they came by this name. The coins our often quite worn, but this is a very nice example.